I generally don't like Summer. Spring is good. Fall too. It's just that the Summer brings with it a lot of sweatiness and general discomfort that I don't particularly enjoy. It does, however, bring with it grilled food which has been absent from our lives over the past decade or so. So with the temperatures in the lower fifties I was forcing it tonight when I decided to fire up the grill. 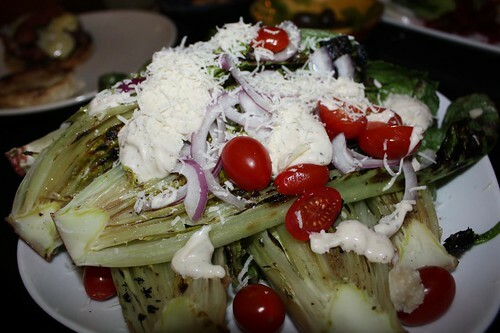 First I grilled the romaine lettuce to make this Caesar salad. While I love the flavor and art of grilling over hard wood, on nights like tonight I regret not having purchased a basic gas grill. After working all day the 30-40 minutes it takes to get the grill ready is a bit of a nuisance. Jen made her famous seasoned burger patties. I think it's a Canadian thing to season your burgers with onions, seasonings, Worchestershire ssauce, and various other ingredients you happen to have lying around. In America it's typical to just put a raw burger patty onto the grill and not even season the exterior. I must be from that mysterious country that lies between the border of Canada and America. It's like Andorra for North America. 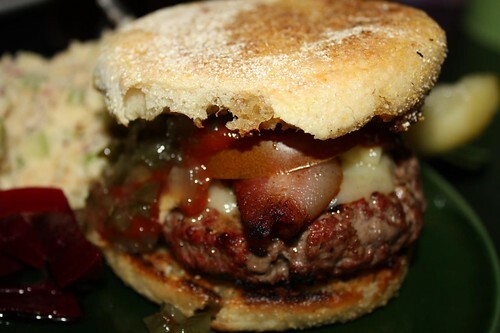 In this country we liberally season the exterior of the burger, leaving the interior untouched. I hope my burger country doesn't get invaded. Jen also made an angel food cake. Unfortunately I forgot to take a picture of the final cake but it bore a striking resemblence the Olympic Saddle Dome. The final product was delicious. 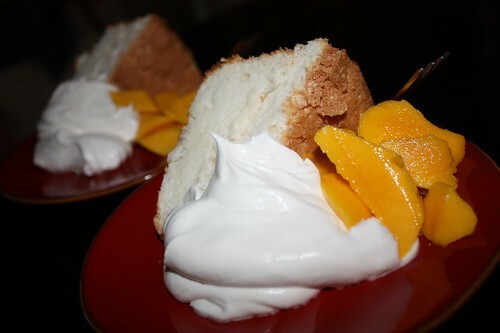 We served it up with some champagne mangoes and whipped cream. And with that summer is upon us. A grey, cold, dreary summer, but all the flavors are there. At this rate we should be roasting butternut squash again by August. There are grills that you can either grill over gas or over charcoal/wood using tyhe same grill. Most marvelous invention. The answer to the 40 minute wait time between firing up the grill and actually grilling is best handled by the consumptiom of 3 beer. Good on Jen for showing you and possibly the world the secrets of better burgers. I like the 3 beer suggestion. The location of the grilling space makes it a little convenient but I still managed this.